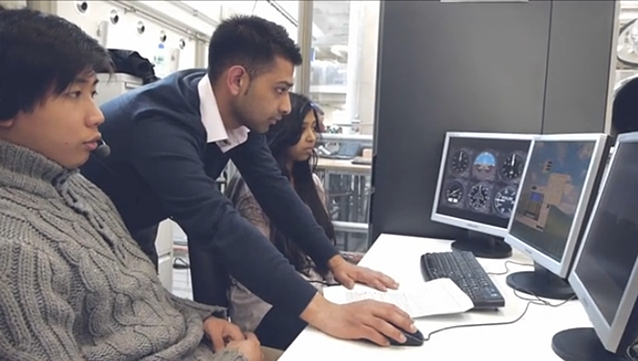 “Tutorial” sessions at Coventry University allow students to apply what they have learned. For more than 5 years, Coventry University in the United Kingdom has pioneered activity led learning –an approach that incorporates hands-on learning and projects to “engage students through motivating challenges.” The approach helps students develop the necessary technical skills to prepare for future careers, while also fostering the development of personal and professional competencies like communications, teamwork, and leadership. Professors in the Coventry Aerospace Engineering program are using Echo360 to better enable activity led learning. The Echo360 lecture capture features help them teach students how to master the complex computer-aided design (CAD) and simulation software widely used within the aerospace industry. “All of our lecture presentations are recorded using Echo360,” says David Sandells, Senior Lecturer in Aerospace Engineering. Sandells teaches a module called Aerospace Applications, which includes a big project in which students design landing gear from scratch. Rather than using traditional hand-based calculations, students use CAD software to design and test their landing gear and are guided by short videos that Sandells has published on Echo360 to demonstrate the CAD processes. The videos Sandells records are about 10 minutes in length, and are organized into specific learning units to demonstrate each step in the design process. Students have access to the videos during their “tutorial” sessions, which are hands-on classes during which they work on their designs with support from faculty. Students can view the videos before the tutorial, and also tune in during class while they practice using the software on their own. “If I didn’t have Echo360, I would have 56 students raising their hands asking 56 different questions about how to use the software,” says Sandells. Instead, students can view and play back the videos at their own pace. This enables Sandells to use his time in class more effectively and answer student questions specifically related to their projects. This is the first year Sandells has used Echo360 to record pre-tutorial videos. He plans to build a repository of videos to continuously improve his teaching practice. He also uses the Echo360 analytics platform to see which videos students watch the most and what topics may need to be revisited to ensure understanding. “The analytics are quite useful, especially when I see that there are a large number of students who dwell on a particular portion of a video and get stuck. It gives me an indication that perhaps something I have presented isn’t clear or easy to understand. The system is very user friendly so I can easily re-record those videos and explain those concepts more clearly,” Sandells adds. Get up to speed. “It’s very easy to record and edit videos using the system,” says Sandells – especially once you’ve gotten familiar with its functions and features. Learn more about how Echo360 powers the modern classroom experience. Click on the icon to watch the video.